Dr Fatoumata Nafo-Traoré, who heads the Roll Back Malaria (RBM) Partnership, said after visiting west Africa: "Understandably, all the health workers' attention is on Ebola." Children's wards which used to be full of malaria patients were becoming "ghost areas," she added. We're really concerned that Ebola will cause a setback to the efforts on malaria. Most of these will have been young children - although malaria is curable. She said: "These countries have previously been really hit by malaria. But five years ago, it was even worse - the deaths were double. "We all agree that no child should die from malaria, because we have the tools to prevent and treat it. "But now, understandably, all the health workers' attention is on Ebola. "We used to see hospital beds with three children in them at a time, because there was not enough space. "Now those paediatric wards are becoming ghost areas, because of the lack of manpower there. "So we don't know who has malaria, and who is dying from it. "Even if the situation is at the same level as last year, that was still very bad in those countries. We're really concerned that Ebola will cause a setback to the efforts on malaria. "And there's a lack of trust and confidence in health workers. There's still a feeling it's them who are bringing the virus to people." When people have fevers, they are often afraid to go to healthcare facilities because they want to avoid being held in the Ebola treatment centres. 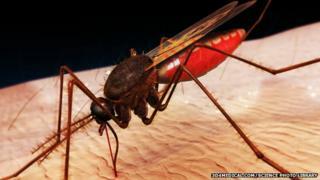 It says Guinea and Sierra Leone met key targets last year for distributing bed nets - a crucial weapon for protecting children from mosquitoes which spread malaria. She told me: "The Ebola treatment centres have a protocol for treating cases of fever with anti-malarial drugs too, because the patient might be suffering from both diseases. "But at the moment when people have fevers, they are often afraid to go to healthcare facilities because they want to avoid being held in the Ebola treatment centres. "We are working with the countries to ensure people are tested for malaria and get the drugs. "It's important to have a co-ordinated approach. A key aim is to decrease cases of malaria-related fever, so the Ebola centres don't get overwhelmed. "I'm worried because of the weak health systems. And communication is so easy between all 15 of the West African countries. "In the past Ebola occurred in remote bush areas. But today it's happening in capital cities. "People are getting well-organised now. As I travelled by road there, I saw checkpoints where people were having their temperature taken and were washing their hands. "Fortunately the world has received a wake-up call - but the response was slow at the beginning."